The duchess pushed for the garden’s creation to the economic benefit of surrounding economies, which suggests just one new site can help turn around a troubled destination. You might not have thought that the north east of England with its many challenges would be the natural habitat of a duchess. But there you might be wrong. 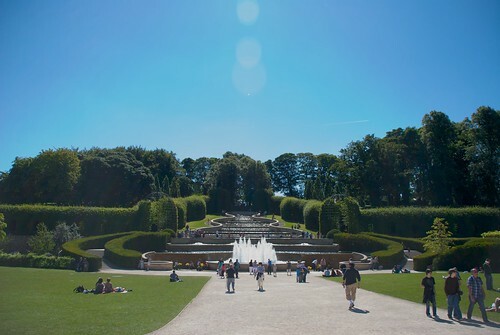 The Alnwick Garden has attracted 3.8 million visitors and £150 million to northeast England. Photo by El Ronzo. The one in residence at Alnwick Castle has a wide and varied local following; not in a slavish ooh-ah way but because she is a do-er and the region looks to have benefited from her doings. The best-known is the castle’s garden, a marathon project which is still incomplete but justifies her perseverance and belief that it would bring visitors pouring in; along with their money. A lot goes into the Duchy of Northumberland’s coffers, but plenty is also spread widely around. An analysis this summer by PriceWaterhouseCooper estimated that in its ten years the garden’s 3.8 million visitors have brought the county of Northumberland £150 million. Each pound paid for a ticket brings an average extra 85p to the local economy. That economy covers a county which has much beauty and some posh parts, but also includes the large former mining area around Ashington and links with the challenging economies of Newcastle-upon-Tyne and Gateshead. Jane Northumberland, as she styles herself, generally goes down well because although extremely privileged, she isn’t snobby; indeed she and her garden are the target of snobbish-sounding critics. They see its showground flamboyance – including a poison garden and a treehouse to make JK Rowling’s eyes water – as vain and vulgar. There are other issues. The cost so far of £42 million includes £16.6 million from public funds, which sits uneasily with a family firm as rich as the Northumberlands. The garden has to fight for its place in the region’s top ten attractions; eighth in 2010 just behind Sunderland’s winter gardens. And the duchess has also come to wholly equated with the project in a way which can imperil succession. There are lots of other things in the pipeline and I’ll know when the time is right to step down completely – but we are aiming for 2015 as the point at which I can guarantee the long term sustainability of The Alnwick Garden without my day-to-day involvement. I am working to raise the funding to complete the garden by then. That’s our target, and it’s important not only to finish it but to protect what we have built: the garden must continue to offer fantastic programmes for the community. There is no specific date and I won’t leave the garden unless I am absolutely certain that it is in safe hands. What next? Time to start planning. She suggests that she’s hoping for a “really good commercial franchise” to take over, while she earns money from consultancies overseas based on her Alnwick experience. Given Downton Abbey’s following, she may get a bob or two from Julian Fellowes. There’s plot material here for the Earl of Grantham’s great-grandchildren.